The Hotel Palazzo Vitturi is a three-star, 16-room boutique hotel on the piano nobile of a lovingly-restored Venetian Gothic palazzo in the Campo Santa Maria Formosa,which is one of our favorite squares in Venice. Both the Piazza San Marco and the Rialto Bridge are a short distance away on foot. 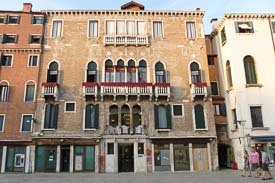 The hotel is especially notable for its decor, which combines authentic Venetian woodwork, terrazzo floors, frescoes, antiques and other traditional features with a contemporary Italian touch. As you leave the boat station, look for a covered passage ahead of you. The passage is called the "Sotoportego S. Zaccaria," and you'll see signs for the Ospedale (hospital) and the Carabinieri (police) above the opening. Continue through the campo and turn left at the northwest corner. Walk a few meters and turn right at the next corner into the Calle San Provolo. Continue a short distance past the Hotel Fontana until you reach a bridge, which will be on your left. Cross the bridge, which will lead you into a short, curved street named the Calle Corte Rotta. Continue walking. The street will become Ragagiuffa (look for a sign on the wall). Soon, you'll reach a small bridge at the end of the street. Cross the bridge to the Campo Santa Maria Formosa. Walk straight ahead. The Hotel Palazzo Vitturi will be on your right, facing the square and the church.